As NASA shifts, "GOES WEST," from its OLD to its NEW SATELLITE, I'm having trouble replacing the two original sat views that introduced this page, among many others, so I found the replacement above, as well as the two big Northeast Pacific Maps, now below. In addition, I've retained a couple of the old-style sat views, ones that provide the detailed views and intergrated data content that make GOES-16 so good, below. I expect to have this, "transition," problem continue as every sat feed from the old GOES West populating the page below is eventually terminated in favor of the new satellite. All the forecast and prediction tools on this site are time-referenced to GMT, Greenwich Mean Time, otherwise known as UMT or Zulu Time. The High Sierra is in the PST zone, which is 8 hours earlier than Zulu Time. That's why we open the USNO GMT time when we review our weather tools. The difference between current Zulu Time and those of the last Satellite and Radar images tells us exactly how old they are. Below find the Best Weather Information for everyone traveling to, backpacking through, hiking, skiing, or driving across the High Sierra Nevada Mountains, California, or the Western United States. All weather reports and forecasts here are focused on the Sierra Nevada Mountain Range, but many resources cover, or can be adjusted to cover weather conditions around California, Nevada, and our whole country. This is good backpacking weather information for all US backpackers. Continental US Surface Map and the North Pacific Surface Forecast Map. I'm leaving the drought Information up (below) through the Winters of 2014-15-16 to track its evolution. Fire Resources added March 27 2015. Big 2015 fire year coming NOW. Big El Nino load of tropical moisture is going to hit someone, if not eveyone, on the West Coast of the USA. After crossing the coast this warm tropical moisture is going to explode when it hits the cold dry air in the middle-North of the US. First normal Fall rains in years-La Nina puttering along in South Pac. High Sierra Backpackers, Hikers, and Skiers need accurate and compreshensive weather information to plan for, and properly gear ourselves for safe year-round backcountry travel. This page is IT. These weather resources allow us to track Winter conditions through the Spring Thaw, and measure the Spring Thaw against that Winter's snowpack to determine when the all-season backpacker can put away the snow shoes, lighten up the gear and finally begin the Summer Backpacking Season. Then we watch for T-storms, fire, and smoke. These weather resources help guide our determination of when it's wise to thicken our gear as Fall approaches, when the Winter gear must again be deployed, and when we can again lighten up into Spring. The collection of resources here is designed for four-season backpackers to determine when seasonal transitions occur, and the character of each season that's transitioning. The scope of these High Sierra Weather assets span from a grand view of our quadrant of the Earth, from our "eyes in the sky" satellites, Pacific-Scale animated weather maps, and the "Earth" supercomputer graphic down to specific "on the ground" temp, current precip, snow depth, and wind information from the available range of reporting stations on and around the Sierra Crest from the various webs of real-time ground reporting stations. All of these broad and narrow perspectives are tied together by the latest combination of graphical and written forecasts and then presented as really cool rain, temperature, and pressure forecasts. For those of us seeking the longer view of what's behind, what is specifically fueling our weather's trends and character can find a wide range of powerful descriptive tools including Upper Air Maps, Global IR radar, and Sea Surface Temps charting some of the underlaying forces driving our weather patterns, as well as just observing the patterns themselves. By "descriptive" I mean graphical representations of the most fundamental Forces of Nature. I learn more every day. In any case, these broad and narrow perspectives on Eastern and Central Pacific weather activity feeding the weather we experience along the Sierra Crest are presented through the most sophisticated sets of weather warning systems, graphical interfaces, animations, and even old-school textual forecasts that I can inform myself and you with. Post up your favoite weather resources. All of this is to inform the backcountry traveler's information and expectations and guide our gear selection for four-season High Sierra Backpacking. Cold pierces and threatens as much during Summer as Winter to the respectively improperly or unprepared backpacker. The goal is to tune our expectations, and therefore our gear to as perfect a reflection of the actual weather conditions as humanly possible. And then give ourselves an "extra layer" of protection! These real-time views and short-term forecasts of the weather over the Sierra are supplemented by a strong set of long and short term weather prediction tools. We are looking to obtain an accurate look of current conditions within the context of the overall seasonal and long term trends our current weather conditions are working within. We are not just trying to understand the character of of each unique hiking season, but figure out its potential to produce extreme weather conditions, and how these condtions will form-up. We are looking at the average to understand the potentials for extreme weather. Then we look for the specific profile of the weather during our trip. But first we acknowledge that extreme unexpected weather always happens, sooner or later. It comes in a wide range of forms, but it always comes Second, the Sierra Nevada can be expected to produce thunderheads, downpours, and lightening during the Summer even during "ideal" conditions. All of this information has been put together to understand what's going on in the Sky. The more accurate our observations and the better our judgment of the factors that affect current conditions as they happen in the sky, the more effectively will can deal with them in the field. This page is not made to go with us in the field, but the lessons learned using it can. Matching our personal observations of storm development with what we see using the various satellite, radar, pressure, front, and forecast information trains and matches our observations with reality to productive effective observation and analysis in the field. Our skills observing and anticipating approaching storm or changing weather conditions and the better we can gage the strength, duration and direction of current or changing conditions, the better we can anticipate and gird ourselves for the challenges when we are hiking in the mountains. The bottom line is we need to get a feeling for what's going on, and what could possibley go on in the sky during the span of our particular backpacking trip in the Sierra Nevada Mountains when we detach from the digital and even the social spheres. We can adjust our gear and our trip parameters to match the range of anticipated and possible weather conditions, once we get a feel for the powerful potentials Nature packs. Many of the weather reporting resources on this page can be used to gage various aspects of weather conditions covering the High Sierra and beyond. California, the Western States, and our Nation are included in many of the weather resouces below, or they can be "dialed out" to cover your area of interest. Most of the weather reporting and forecasting tools here can be easily adjusted to cover different regions of the United States. All links to outside weather resources open in a new tab. about Backpacking the High Sierra. This fantastic tool opens with the current day's report of current conditions, while clicking to future dates brings us to graphical forecast displays for the various aspects of ourl forecast for upcoming days. These would be the ranges of cloud cover, of rain and snow cover, of fog and temperature, among the wide range of graphically presented forecasts. It also has standing wind and gusts! Adjust the dates through the upcoming week to see them graphically presented in a manner that beats the hell out of the local talking heads on radio, tv, and cable. To use it adjust the day-date to the desired forecast period then scroll over the forecast categories on the Left sidebar to review the different aspects of the Weather Forecast through this nifty graphical interface. Graphical Weather Forecast of the North & Central Sierra, Northern California. Note that this cool graphical interface provides a wide range of weather data covering a large geographical area over a long span of time. This interface is adjustable out to 6 days into the future...The Map changes to display the weather information for the category you specify by scrolling over it on the sidebar list to the Left of the map, which lays out the different aspects of weather conditions we can view graphically. This presentation is excellent for getting a good, clear idea of changing conditions over the total span of 7 days and nights along the length of the Tahoe to Yosemite and Pacific Crest Trails in the North Sierra, and the John Muir and PCT in the South Sierra. Current Conditions, Temperatures, and Snow Depths from an extensive web of High Sierra reporting stations. Click the SNOTEL station data you want to view, then the "7-day report" to view current snow and temperature conditions. The Fed list above is better organized and offers easier access to a range of Sierra Nevada information than California's ground reporting station system, but it falls far short of the extensive coverage of the Mesowest System. which is the second resource below. Note that the California State System has lots of "monthly" reporting stations that are not good for backpackers desiring current snow, temp, and rainfall conditions. Yet California does have lots of real-time reporting stations as well, so check them out. The monthly reporting stations are irrelevant for current backpackers, while the real-time stations provide timely valuable snow depth and temperature information. Above: View California State, CDEC Station Locator Map. California's system is comprehensive but plagued with data collection, presentation, and navigation issues. They appear to be working on these issues, so this interface is improving. Navigate the map above to your desired location in the High Sierra. This will locate the stations in the visible portion of that particular map quadrant along our trails. Read the selected station data for current, recent, and historical weather conditions. The monthy station reports are mainly used to measure the snowpack and its water content at specified dates for water/runoff prediction purposes, not to read out current conditions for us backpackers. The automated real time reporting stations do. They read out report snow depth, temperature, wind, and moisture levels which are valuable bits of backpacker and skier information. View Federal Mesowest Station Map, Northern California. A fantastic system. Check it out! Scroll our mouse over various MESOWEST stations to view basic data from each, then click the station to see its extended report. Especially see the California maps, and, "Large Scale Views," at the bottom of the list. The Mesowest system is excellent. Mesowest is well-organized and well stocked with real time reporting stations across the High Sierra and foothills. But it is spotty for great lengths of the main PCT and TYT along the Sierra Crest. Nonetheless, scrolling around the Mesowest Reports is the best way to see how conditions and temperatures vary across the Sierra, and are dependent on elevation and aspect of the reporting station. Mesowest can provide enough information to develop good inferences about conditions at a range of aspects and elevations along the Sierra Crest. A weather reporting system for pilots, but it may have a reporting station you are interested in. Layers for Fronts, Pressures, Radar, Winds, & Etc. Continental US Surface Map and the North Pacific Surface Forecast Map. Contrast the Satellites and Surface Maps with the Earth set to Wind at 500 mb with the Mean Surface Pressure overlay to observe and identify the forces at play. Click "Animate" button, then select, "Java Script," then "Every other Image," and the most current animation will load and play. Compare the two Satellite Views above with the North Pacific Surface Map. Contrast the Sat Views against the surface map then check them both against the Future Forecast Models to use our historical perspectives to track and come to some understanding of the future dynamics of weather. Use "Earth's" graphical interface to identify the pressure zones and winds driving the weather we identify from the Satellites. Run the "Loop" versions, above & below. Tropical Transport Mechanism, credit to RAMMB, CIRA-CSU. Continental United States and South America ir satellite-animation. Problems with the Satellite Images above? See the Aviation Weather Center Satellite Imagery page. for as close inspection as the resolution allows. Animation above: GOES Northeast Pacific. Water Vapor Loop. wind, fronts, storms and pressures. Check the GOES index page for all GOES satellites. The satellite list links to infrared and visible light animations as well as the water vapor animations shown above and below. 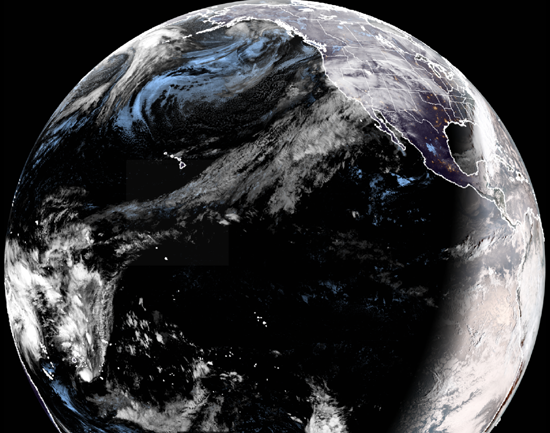 Big Picture Weather Animation: GOES Western US. Water Vapor Animation. Use "Earth's" graphical interface to identify the pressure zones, winds, temps, humidities, composing and driving the weather we identify from the Satellites. 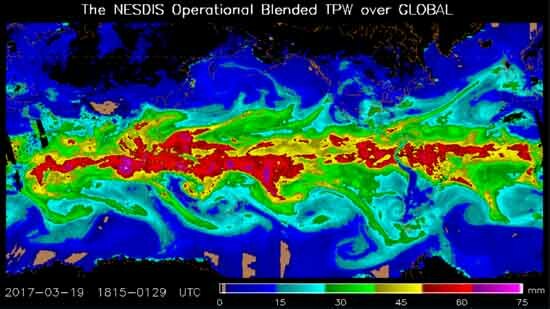 We can also observe graphical representations of cloud and precipable water, among other weather phenomenon. Earth offers an amazing tool to compare, contrast, and draw together and understand the relationships between various aspects of weather. Traveling? GOES covers the entire US and the entirety of the Pacific and Alantic Oceans. Check the GOES index page for all GOES satellites. Click any part of the regional radar maps above to view the local radar for the area clicked. The California Radar page is linked to the National Radar Map of the whole US. Radar Data laid out on a National Map from 1995 to the Present. Above is an almost real-time highly detailed presentation of amalagated Radar and Surface Air Maps along with active Storm Warnings as they are gathered from the field over the course of the present day, as far as I can tell. This gives us a kind of "super-radar" providing us the with the best hints as to exactly how current regional conditions and local trends are actively playing out. This map shows "outflow boundaries" of tropical/thunderstorm activity, pressures, active radar rainfall, and bunches of interesting storm and flood warning information too. Is the Freezing Forecast Above Working? 500-hPa Vorticity & Wind, 18,000 Feet, "The Steering Level"
The various runs are of different models with different resolutions. Hit the Green Tab, located at the top of the Right Sidebar, for the, "Latest Run,"
See the, "Green Tab," on the image above? How Much Water's Out There? Below we find precipitation data informing us how current behaviors are building future trends and exactly how we are setting-up against past averages. Rainfall up to almost the present Moment. 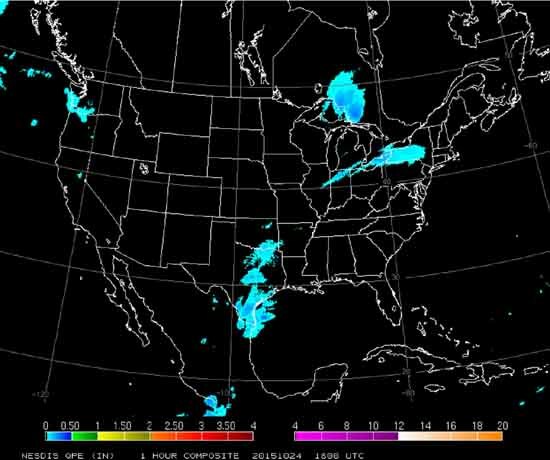 NESDIS uses satellite based IR and Microwave detectors to accurately measure precipitation across the continental U.S. The image above is linked directly to the NESDIS Animation for the last six days to the last hour. Rather than showing us what will happen, it shows us precisely what already happened. The immediate (and long-term) past offer good insights to figure out what will happen in the immediate future. Click the link above to link to the NESDIS page. Here you can view specific images or video timelines. On the page above select the "12 hour" link, then "Animate this product." A new page will load. Select "Loop," and the animation will load the images in a clunky fashion. After loading it runs smoothly displaying the last five days of precipitation up to the current hour. Otherwise just click the graphic image above and let the link load to watch the last few day's precipitation up to almost the current moment. Above: The "old" Climate Prediction Centerat NOAA offers probabilities of Temperature and Precipation for the United States from six days to three months into the future, along with weather hazard and drought assesments. 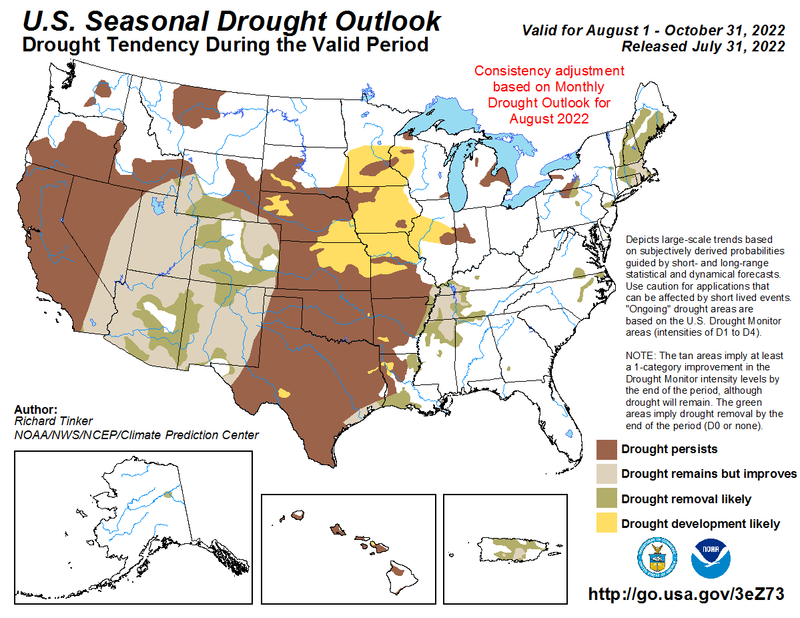 Below we find the "new" digatal presentation of projected precipitation and temperture trends. These resources are where the National Weather Service orginates Dought, Flood, and Freeze warnings for the upcoming week, month, quarter, and season while tracking the trajectory of conditions during the current season. From this page we can find all the current medium and long term predictions for rain, snow, frost, drought, and storms. Check it out. This is a good one to keep an eye on. It gives clues about the overall context our current weather trends are working within. Though not as reliable as shorter-term forecasts these long-term predictions may alert us to the potential range of extreme (or gentle) conditions we could encounter beyond the scope of the typical six-day weather forecasts. It is good to know how the general conditions are trending. Folks planning an early-season start for their Pacific Crest Trail attempt will want to keep a close eye on the evolution of late-Winter weather and snowpack conditions into Spring, and the projected weather trajectory of Spring to determine when the snow will clear from the high passes, or the point when their level of skills will let them into the High Sierra Mountains. Between the long term predictions and shorter-term forecasts presented here, supplemented by our orbital satellite eyes in the sky looking "over the horizon," combined with our regional views through comprehensive radar assests down to our "on the spot' real-time High Sierra ground station reports, we should be able to at least figure out the range of weather conditions and tempertures we can possibly encounter in the High Sierra during the first seven days of time our backpacking trip covers. Beyond the 7 days we can fairly accurately predict an expected range of future weather that we can use to get a good handle on this season's character and weather trends sufficiently to gear ourselves properly to deal with them. These resources are especially important for those of us doing the long term planning required to hike the Pacific Crest, John Muir, Tahoe to Yosemite, or Tahoe to Whitney trails. Tracking each season's patterns of additions and subtractions to the Sierra Snowpack as Spring approaches will eventually give us a pretty good idea of when the high trails over mountain pass will first be open, then totally clear of snow. Observing the timing and evolution from Winter through Spring informs us as to the temperture trends, their ranges, and gives us a basic idea about the character of the upcoming Summer. The recent trend for the last 20 years has been towards more abrupt Winters, shorter and earlier Springs, and longer dry Summers. The weather information on this page tells us if we should anticipate an early, average, or late clearing of the Winter snows from the High Sierra. The resources on this page can tell us what conditions to prep for, and this informs us as to what gear we must pack to cover the range of potential conditions we observe are possible. Good weather information also gives us an idea of when drying conditions will cause the mosquito populations to fall, water availability, and so on. From understanding the potential character and range of High Sierra Weather that can blow in during the span of our backpacking trip, we always ask ourselves, "What if something bad blows in unexpectedly?" "What's the worse weather that can blow in?" Once we're sure we can handle the expected range of conditions our thoughts must turn to the unexpected. I like to know that I will survive the worse possible conditons because the thermal protection provided by wearing all my gear in my tent in my sleeping bag is sufficient to deal with the worse weather that can blow in. Below we can look at the span of our trips weather history back to 1995. The historic RADAR shows storm-precip. activity on given dates. NWS Big Picture Weather Maps. These classic weather maps below project US pressure, front, and storm conditions six days into the future in daily intervals, with the first two days issued in 12-hour intervals. The NWS currently has three excellent animated weather maps we can profit from, one for the continental US, another for the whole North Pacific Ocean, and the third focused on the East Pacific Ocean, off the West Coast of the United States. All three are linked to below. I strongly suggest the 96 hour Pacific Ocean Loop be compared with the US loop, then both considered through the perspective imparted by the various flavors of satellite imagery. Combining these perspectives gives us powerful tools to understand developing conditions. This is a very cool presentation. Slow it down and study how the experts see atmospheric pressure waves moving across the United States over the span of a week. The US animated weather map is a bit frustrating for us West Coast backpackers, as our view of the Pacific Ocean, where our Sierra Weather is brewing and stewing up for our future enjoyment, is cut off. 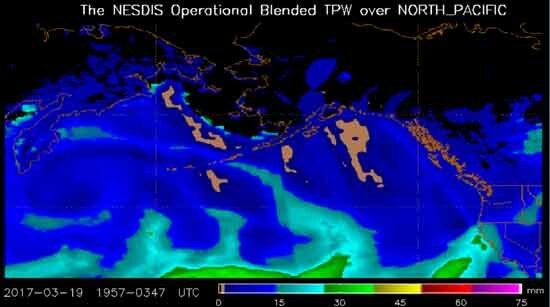 Below we find the solution: The North Pacific Ocean Analysis of the National Weather Service's Ocean Prediction Center . The JAVA versions of the Surface Maps below can be MAGNIFIED in your BROWSER! I suggest clicking "Flash loop," and "play loop below" to get the smoothest operation out of the animation graphics. I currently prefer the JAVA loops because they can be magnified in my browser. The weather map above of the "Whole North Pacific" is the most current highly detailed version of the animated maps above. 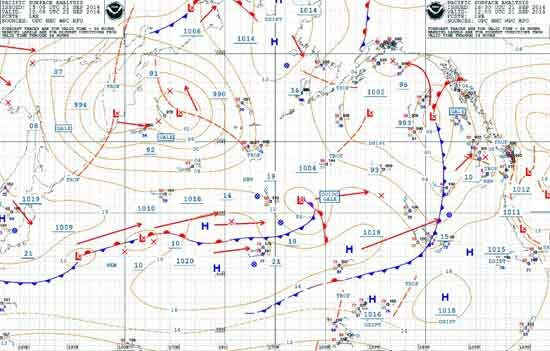 The very instructive and informative Surface Maps above and below come from the Pacific Ocean Analysis of the National Weather Service's Ocean Prediction Center. Below we have the current snapshot of the North Pacific Ocean and the Western United States. EARTH Use "Earth's" graphical interface to identify the pressure zones, winds, temps, humidities, composing and driving the weather we identify from the Surface Map above. We can also observe graphical representations of cloud and precipable water, among other weather phenomenon. Earth offers an amazing tool to compare, contrast, and draw together and understand the various aspects of wind, temp, pressures, humidity depicted together. I like to set up Earth and the animated North Pacific Animated Loop Map to compare and contrast the perspectives our maps, satellites, and radar tools give us of almost every aspect of our weather. A broader perspective and expanding, deeper understanding of the amazing nature of our weather can rise from putting all these amazing perspectives together. 10 hPa, roughly 84,998.2 feet of elevation. A rough table of pressures and altitudes. All of the daily interval Weather Maps out to six days and the 12 hour interval Weather Maps out to two days are available from the Weather Maps page. The High Sierra is in the PST zone, which is 8 hours earlier than Zulu Time. on this 200 mb height anomalies animation below. Air and wind altitudes are measured at points of pressure, rather than a set altitude. These pressures roughly coorelate with altitudes, but vary with pressure changes due to vast pulses of high and low pressure zones like moving links of a chain consisting of rising zones of heating and vortexes of cooling differential zones sliding around the planet. the temperature between 36 090 and 65 600 feet [20 km] remains constant at –56.5 °C. Excellent Cloud Info from Pilot Friend too. The pressure anomaly maps above and below show the anomalies as the altitudes of the pressure zones rise and fall in relation to changes in density. Below we have a view of the differentials in the altitudes of the 500 mb pressure zone circulating around the North Hemisphere. 500 mb roughly relates to around 18,000 feet of elevation, and is referred to as the Steering Level for its importance in directing storms. "El Niño is expected to form and continue through the Northern Hemisphere winter 2018-19 (~80% chance) and into spring (55-60% chance)." "La Niña conditions are favored (~55-65%) during the Northern Hemisphere fall and winter 2017-18." Earth Observatory, March 21, 2017. Earth Observatory, February 14, 2017. 200 mb and 500 mb global pressure anomalies. Pressure anomalies and thunderstorm activities dance on El Nino heat. Increased or dense areas of diminished Outgoing Longwave Radiation are indicative of Tropical Thunderstorm activity associated with El Nino surface and subsurface water heating. These Tropical Thunderstorms in turn generate anomalious Westerly Winds that can carry great flows of tropical moisture generated by these hot water storms Eastward to the US of A. 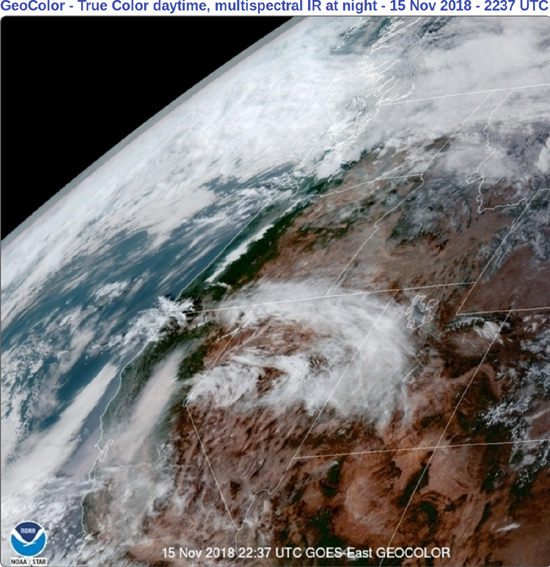 Above and below we see reports from zones where Pacific Ocean heating fuels tropical storms driving winds that loft and push vast tropical flows of moisture towards the West Coast of the USA. The ENSO team looks for signals of an active El Nino by tracking Central Pacific hot spots, the storms above them, and the winds born out of these storms that can drive potential skies literally full of water towards the parched & flooded valleys, mountains, and plains of North America. Below we see thunderstorms revealing an important part of the mechanism of ocean heating that launches the Westerly winds loaded with tropical moisture depicted above. El Nino events are indicated by T-storms shifting towards Indonisia from the Central Pacific, which these animations above and below observe. Check out this informative essay about monitoring Intraseasonal Oscillations, and how they affect regional weather while being interwoven into global weather patterns. Also see the Monitoring Intraseasonal Oscillations products page for a bunch more interesting observations. We are going off the deep end now. Or, should I say, flying higher? I watch and learn, then gather new tools, and watch and learn more. 35,000 foot wind flows. 250 mb. El NIno Sea Surface Temps and Anomolies, above. What do we use as a reference point when we look at the altitudes of the 500 mb pressure level on the map above? We compare the altitudes we see on our current Upper Air Maps with the monthly average for that specific level of pressure between 1981 and 2010. On the page above we can generate charts showing average altitudes all of the Upper Air Pressures depicted here for every month of the year. Using this information we can determine how our current readings are diverging from the 1981 to 2010 average. This in itseff under-estimates change because of the radical changes in the weather patterns that had already occured by 1981, and have increased to 2016. Nonetheless, checking the historical altitudes of the Upper Air Pressures mapped out here for every month of the year gives us a historical baseline. Here's how: Navigate to the page linked-to above. Click the "Create Plot" button at the bottom of the page linked to above for this month's 1951-1981 pressure averages. Totally cool. A rock-solid reference. Use it! We can compare current pressures and temps with the earlier or more recent periods of long term averages for all the Upper Air Maps here by so-adjusting the Climate Composite Generator. Again, totally cool. What a geek I've become, as you should too, to understand the dramatic destructive forces of radical change moving rapidly through the atmosphere and weather..
10,000 foot wind flows. 700 mb. 5,000 foot wind flows. 850 mb. 2,500 foot wind flows. 925 mb. Wind is measured at points of pressure, rather than a set altitude. The above elevations are more estimates than the precise altitude where the specified pressure occurs. The current Upper Air Maps of the various pressures depict the altitude distribution of each specified pressure. likely extent are always valuable bits of weather information. Regional Snow Analyses: Western Coastal. Adjust the date to see today's conditons, recent trends, and to compare year-over-year. 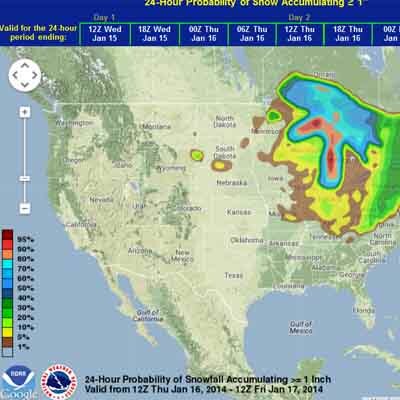 This resource gives us the snowfall probabilities three days into the future. Compare the probability charts for different depths of snow for the most accurate picture of upcoming conditions. Besides the snowfall probability maps above, the snowfall probability pages also feature links to nifty national projections of surface low tracks and the potential for freezing temps, linked to below and above. High Sierra Warnings are issued by nearest local NWS office, listed North to South above. Scroll down list for all nearby warnings. The map below is where all local warnings are consolidated. NOAA and NWS web interfaces have evolved and improved signifigantly over the last 5 years. This weather forecast covers both the Tahoe to Yosemite and Pacific Crest Trail routes from Lake Tahoe to Sonora Pass. Feather to the Merced Rivers. The two forecast zones linked to above cover the North Sierra weather from Lake Tahoe down to the Yosemite Boundary. 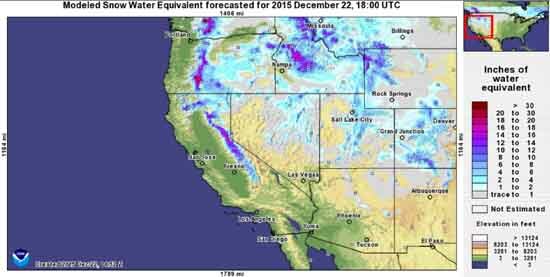 The two forecast zones linked to above covers the weather over Eastern Yosemite down to the Silver Divide. This KEY map covers the majority of the PCT and JMT route thru Yosemite South to Kings Canyon just a bit North of Mount Whitney. Combining the second forecast zone above this one with the forecast above reveals the weather over the Sierra Nevada from Yosemite National Park South covering most of Kings Canyon National Park to just North of the Whitney Portal. The map above completes our view of the forecast zones covering the High Sierra weather over the trails described on the guide between Lake Tahoe to Mount Whitney. The Zone Above has been terminated in the April, 2019 Forecast Zone reorganization. In April of 2019 I noticed the NWS had changed the organization of their Forecast Zones in California, making the old zone from Sonora Pass to Yosemite into the new, "Central Sierra," zone, and adding the zone above, the SEKI zone. Yosemite National Park''s Current Alerts & Conditions page. Tahoe to Whitney is gradually building links between the trail guide pages and the specific weather resources and ground reporting stations on the Sierra Nevada Crest best covering that location. Check the Permits page on the trail guide for links to the National Forests in the Northern Sierra. Each National Forest posts-up a "Conditions" page with some small bit of trails information, and a bunch more info about the status of their backcountry & road conditions. From the National Forest and Park pages we can determine who the Wilderness Ranger is, and try to hit them up for current backcountry information. The Wilderness Rangers generally get out and ride all the trails at least once a season after the Spring Thaw to check things out and make the trail repair report. After that the Trails Ranger is the best resource. Trails Rangers manage that National Forest's Trail Crews, so they are generally pretty up to date on current conditions. Memoral Day marks the opening of most, if not all High Sierra Resupply spots. Labor Day marks the beginning of the end of the Summer Season. These Links to the Backpacker Resupply Locations between Tahoe and Whitney can help you plan the upcoming Summer's Tahoe to Whitney backpacking trip. 2015 formed up as about the earliest opening of trails-facilities-roads in history. 2016 is as much as a freak year as '15, but being weird in quite different behaviors, so far. The greatest hazards in the Sierra are Lightening and Fording, in that order. Lightening is the greatest hazard, as it occurs during the height of the Summer Backpacking Season. Fording is most dangerous during the Spring Thaw. The constant hazard of High Sierra lightening is fueled by high temps evaporating huge amounts of moisture in the San Joaquin Valley. The proper breeze blows these superheated masses of moisture rich air up the West Sierra flank, where they explode into very beauitiful and very dangerous afternoon storms. It behooves High Sierra Backpackers to carefully observe the the general weather trends, and especially the evolution of the daily weather. If strong local cells of moisture start appearing after 11 am these may develop into very dangerous afternoon thunderstorms jumping with lightening. If so, we must change our hiking schedule to avoid being hung out on exposed terrain after 2 pm. High Sierra lightening storms generally consolidate by 2 pm in the afternoon, and the stronger ones end with the setting Sun. Lapse Rate: 2.7 degrees per 1000 ft. average wet. This is the wet Lapse Rate, which applies to the majority of air masses blown off of the Pacific Ocean or evaporating out of The Valley. These air masses contain lots of moisture, which retards chilling as they gain elevation to cross the Sierra. See the explanation at the bottom of the pressure chart, above, for a bit more on lapse rate assumptions. I warn in my Winter Gear Videos of the dangers of Eastern Continential Cold Air Masses blowing into the Sierra during the Winter. These air masses are composed of very dry frigid air moving Westward off of the Great Plains. An ECCAM brings frigid dry air to high elevation from the East. In this case I believe the extreme cold this weather feature brings to the Sierra is partially a product of the "dry" Lapse Rate, which is 5.4 degrees per 1000 feet, as well as this air having been deeply chilled and dried out by a clear, cold High Pressure Zone over the Great Plains before moving Westward. Winter is the time of year when understanding the possibility of a Continential Cold Air Mass coming our way out of the Great Plains becomes an important consideration packing your Winter kit. By far the two most dangerous things in the Sierra Nevada are river fording and lightening danger. River fording is most hazardous during the Spring Thaw and early Summertime. 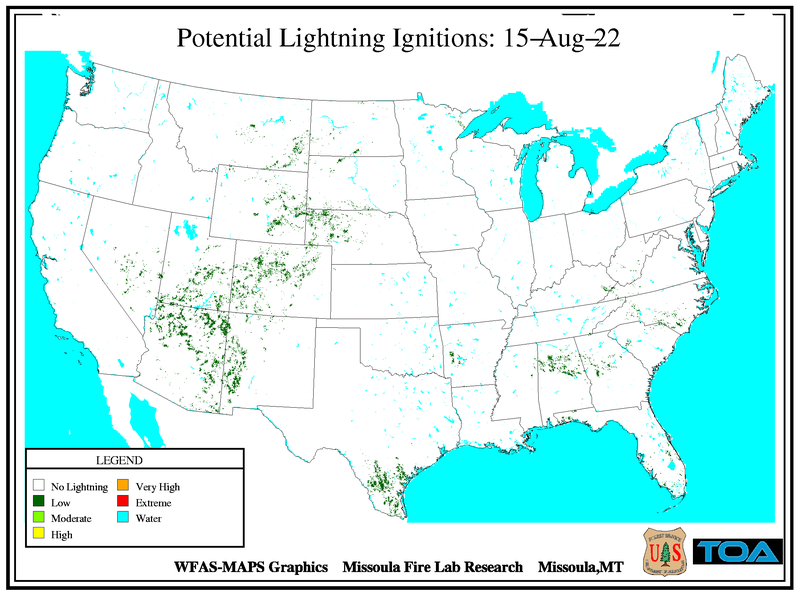 Lightening dangers are dependent on local atmospheric conditions, mostly depending on each year's pattern of Summer Heat Storms. The NWS instructional information is excellent. Except for the lightening safety info, which is next to worthless. No, I don't/can't "stay indoors." What buffoons. High Sierra Backpackers can be 9+ days' hike from any structure. This means we've got to have a plan for lightening. Doc Doswell puts all the best information and common sense all together in one place. On the bottom of the page we have our observation and prediction tools. Wilderness Medical Society Practice Guidelines for the Prevention and Treatment of Lightning Injuries, WEM, 2012. National Weather Service Wind Chill Chart. The chart links to the NWS Wind Chill Safety Page which has more information and a Wind Chill Calculator. The map and link bring us to the National Weather Service Heat Index: 95 degrees is the line. The heat safety information linked to above is vital information, especially as I observed 94 degrees in Jack Main Canyon in Yosemite on July 2, 2013. It was tough hiking. In fact I've experienced very high temperatures during daytime in the Sierra Nevada Mountains many times, followed by very cold nightime temperatures. I observed 94 degrees in Jack Main Canyon in Yosemite on July 2, 2013. It was tough hiking. In fact I had to use extreme measures to avoid problems. Having a working knowledge of how to prepare for, identify, and deal with dangerous extremes of hot and cold serves us well. These are times when we must not just "push through," but must take timely meas wind=ures to anticipate, measure, and properly neutralize these threats. If not, they may neutralize you. 2009-10 had a weak-normal Winter. 2010-2011 had a huge Winter and Spring. 2011-2012 had a very weak Winter. 2012-2013 had almost no Winter. 2016-2017 Starting with normal Oct Rains (rare in recent years), Weakening(?) with La Nina puttering along? NO: Strong Fall tropical storms out of SW in December complimented by huge series of tropical and storms out the West. 2017 Record snow pack into Record Heat Wave to begin Summer. From one extreme to another. and back again? A weak Winter brought an early opening to the the Summer of 2012. Then the next Winter, of 2012-13 was incredibly weak, bringing another very early opening of the High Sierra trails during the Spring of 2013. Check out the Winter through Spring Thaw of 2012 article. 2014 was the hottest, driest Winter in history, until 2015. Oct 5: notes about various parts of the trail, see the Trails Forum. I'm still recovering from a series of injuries and physical insults, so you guys can add to our knowledge through the comments link below, or as your own article in this, the Seasonal Conditions Reports Forum. Only registered members can post articles.